Mosh Pit Math: Physicists Analyze Rowdy Crowd At a heavy metal concert five years ago, physicist Jesse Silverberg had a "eureka" moment: The jumping, raucous fans at the show seemed to be moving about like molecules in the air we breathe. 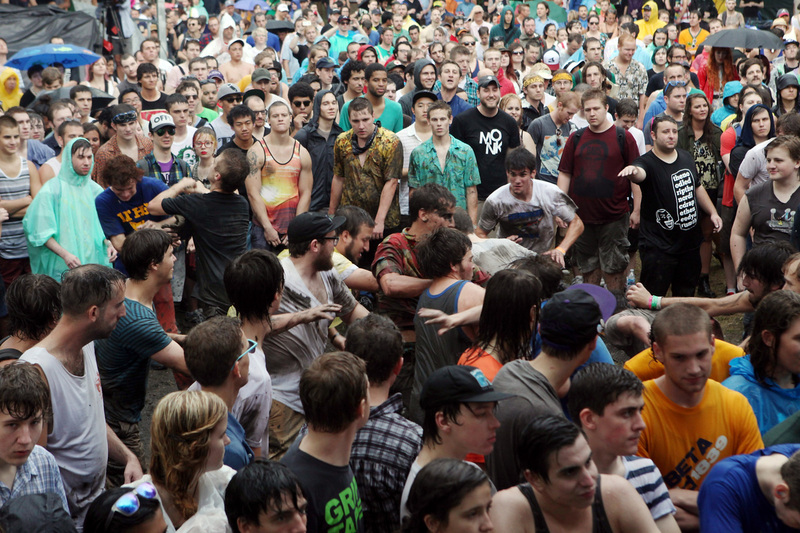 So he and friend Matt Bierbaum set out to understand the patterns within mosh pit motion. Fans in the mosh pit during the performance of Liturgy at the 2012 Pitchfork Music Festival in Union Park, Chicago, on July 14, 2012. Physicists have worked out the basic rules that describe this kind of motion, so Bierbaum and Silverberg decided to look for the rules of motion in moshing. They went to concerts and studied videos from YouTube. Silverberg emphasizes that no tax dollars went toward buying concert tickets — the study is a labor of love. Note: This video contains profanity. This mosh pit simulator is based on the research by Jesse Silverberg and Matthew Bierbaum. Click the Show controls button at the bottom to play around with different parameters of the mosh pit. To learn more about what the parameters are, click here. To play with the full version, click here.